Lots of parents like to buy a Moses basket for their newborn to sleep in during the first few months. 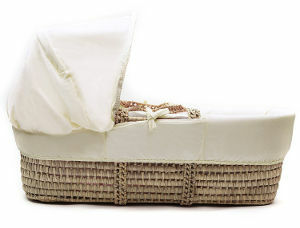 The best Moses baskets allow you to have your baby with you so they can always be sleeping or napping by your side. The smaller size of them compared to a cot means your little newborn will feel safe and secure aiding them to a better sleep. 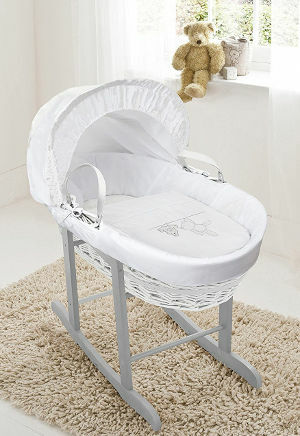 In general, a Moses basket will be the best place for your baby to sleep until they are around 6 months. Once your baby can sit unaided or can roll from side to side then you will need to move them into a cot where they are safe to move about a bit. Always check that the mattress fits really close to the sides of the basket and that there are no loose trims or material that your baby could become tangled in. Some baby baskets come with stands so you’re not resting the basket on the floor, allowing air to circulate and to give you a better position to lift your baby in and out of their basket. 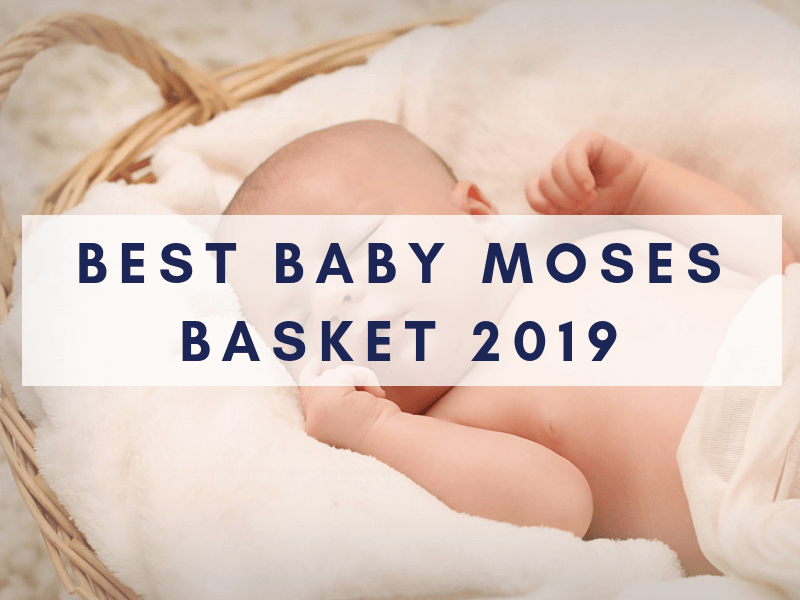 We have taken a look at some of the best baby Moses baskets available on the market so they should be perfect for babies arriving in 2019. The Kinder Valley Waffle Moses Basket is made from the finest waffle fibres, making it the ultimate starter bed for your newborn. The water-resistant and breathable mattress keep your baby comfortable at all times. The easy-care polycotton padding on all sides eliminates any risks of bumps. The minimalistic design suits parents looking for a simple yet stylish space to allow them to confine their baby safely. The Kinder Valley Waffle Moses Basket strikes a natural balance between style and comfort without sacrificing quality. 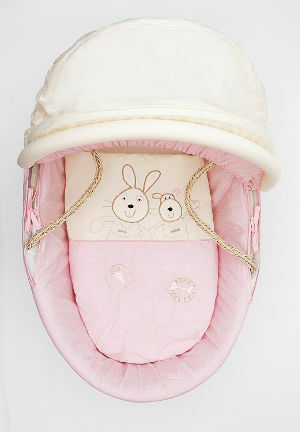 An adjustable fabric covered hood ensures that your little one can snooze away in a quiet little paradise. You can adjust the shade to minimise the amount of light getting to the basket, to ensure that your baby sleeps through daytime naps with little distraction. Cleanliness is a vital ingredient when caring for a newborn child and the Waffle Moses Basket from Kinder Valley makes is quite easy to do so. The water-resistant, baby safe, and machine washable mattress lets you keep the basket clean and tidy easily. The mattress is also breathable to encourage natural air movement and eliminate any odours. You can trust this Moses basket to last you through the first six months even with heavy usage. 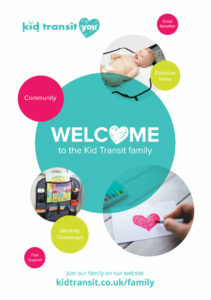 The people at Kinder Valley boast more than 30 years producing an assortment of baby items that conform to the highest standards in the UK and worldwide. The basket dimensions are 86 x 47 x 30 cm. The Kinder Valley Tiny Ted Moses Basket is the perfect baby item when looking for a small starter bed for your little bundle of joy. It is slightly smaller than the Waffle Moses Basket but it does carry a smaller price tag too. Despite the affordable price tag, this Moses basket boasts all the luxury trimmings to keep your baby safe and comfortable. The soft padding behind the easy care polycotton all around the basket eliminates any hard surface that could hurt or bruise your little one. The safe baby mattress is also waterproof to keep the basket clean and tidy at all times. It is also breathable to encourage air circulation and assist in heat dissipation. In case you have an accidental spill, you can simply toss the mattress into the washing machine and it will dry in next to no time. The small and compact design makes the Kinder Valley Tiny Ted Moses Basket a perfect way to keep your baby near when working around the house. Do remember to only carry Moses baskets when they are empty. 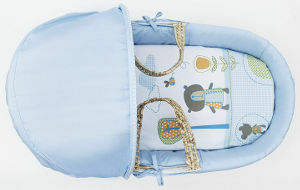 The soft padding also cushions against vibrations to let your baby sleep peacefully. The adjustable hood shades your sleeping baby from a harsh light that could make their nap less comfortable. The lightweight nature of the basket makes it a perfect companion when going out for a picnic or a quick trip to grandparents. The basket fits perfectly in a rocking stand that you can purchase separately to help you rock your baby to sleep without straining your back. 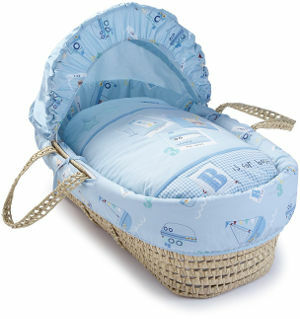 This Moses basket measures 50 x 30 x 86 cm. Suitable from new-born for up to 9kg. If you want to buy a Moses basket with a stand as one package then you can’t go far wrong with the ones we feature here. Make sure you’ve measured up the space you’ll be putting the stand in so that it fits well in your bedroom. With these Moses baskets, you can either get a rocking or a folding stand depending on what your needs are. 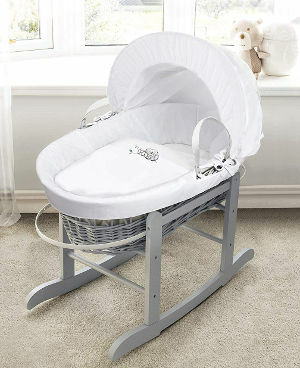 The White Teddy Wash Day Moses Basket and Rocking Stand looks exquisite and elegant. The basket is dressed in all-white easy-care polycotton with soft padding and the wicker and stand is finished in a stylish soft grey colour to match any decor. The baby basket has a detachable hood to provide warmth and shield your baby from draughts through the night. You can loosen or tighten the hood using the fasteners on the sides of the basket. The stand is made of solid pine and has a beautiful grey finish. It’s strong enough to carry up to 9kg of weight. As with most Moses baskets and stands, you can easily move the basket from the stand and place it on the floor. The White Teddy Moses Basket and Rocking Stand is supplied with a water-resistant and breathable mattress, so you can easily clean it to keep your baby’s sleeping environment hygienic. 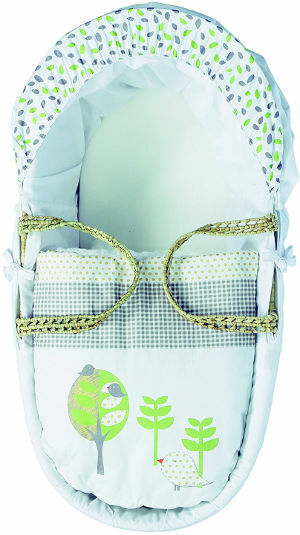 The Sleepy Little Owl Moses Basket and Rocking Stand is such an elegant design that will look great in any room of your house. The basket and stand are of high quality and so should last for more than one child if your family continues to grow or at least bring you some money back if you decide to sell it on. The cool grey stand and cute motif on the cover will hold your baby for all their naps and night sleeps until around 6 months old or until they are sitting unaided or able to roll. The supplied mattress has a washable cover that can easily be removed so you can keep the basket clean and fresh. The cover is also water resistant, breathable and hypo-allergenic to keep your newborn safe and comfortable while they sleep. 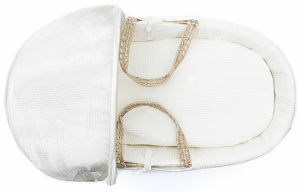 The sides of the basket are padded to protect your baby from any bumps. The hood supplied can easily be put up or down depending on how much shelter you want to provide during their nap. The Beary Nice Moses Basket and Rocking Stand is another great option if you’re looking to buy a baby basket with a stand. Like the other two options, this one can be bought with either a rocking stand or a folding stand depending on the space you have. 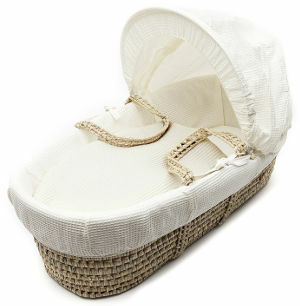 The Moses basket is in its original palm-leaf brown colour, giving it a distinctively traditional look. The basket is made of woven palm-leaf and features a pair of woven handles so it easily be moved from the stand. It is lined with easy-care polycotton that’s softly padded for extra comfort. 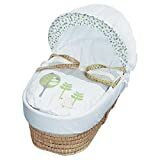 And as you’ve come to expect from baskets of this quality, the Beary Nice Moses Basket is also lined with a comfortable, water-resistant mattress to make a complete bedding set for your baby. If you prefer a more classic look that mothers over the years have come to identify with newborns then you can’t go wrong with the Beary Nice Moses Basket and Rocking Stand. 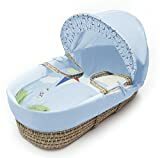 If you know you’re expecting a boy and want all your items to have a blue or boy theme then take a look at these lovely Moses baskets that will have him sleeping like a dream. 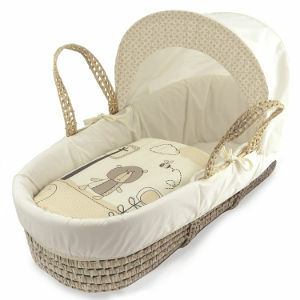 The Clair de Lune Moses Basket from the Ahoy range is simply perfect for your newborn baby boy. Made entirely of beautiful woven palm, the Clair de Lune comes with a distinct stitched blue dressing that’s ideal for baby boys. 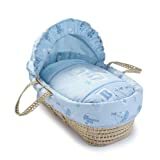 In fact, all the material used on the Moses basket from the hood to the cover lining and the coverlet is a very cute sailing theme. The set comes with a firm mattress to support your baby. All the covers are removable and washable so you can quickly make the baby basket fresh and clean again after any illnesses. Clair de Lune who make this Moses basket is a Manchester based company who have been making baby bedding and accessories for over 70 years now. They are highly respected in the industry and have a wealth of experience behind each piece that they sell. This lovely boys Moses basket is part of the Kinder Valley baby collection and is ideal for newborns all the way to around 6 months. The maximum weight limit is 9 kg so even the biggest babies should still get full use of the basket. 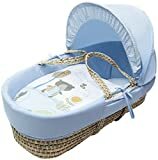 The Tiny Ted Moses Basket has all the features you’d need in a starter boys’ Moses basket and it’s very reasonably priced. The nicely woven palm basket is durable and has that attractive time-honoured look. It is lined with easy-care polycotton dressings in blue colour and a little padding for extra comfort. The coverlet has a beautiful teddy design on it that will go with a baby blue nursery scheme. The adjustable hood is more than a decoration to make the basket look cute; it keeps the air inside the basket warm (and your baby too). You can take it off so that it is easier to carry the basket in one hand. The Tiny Ted also comes fitted with a water resistant and breathable mattress. You can stay worry-free all night knowing your baby’s home will not get ruined in case of a leak. 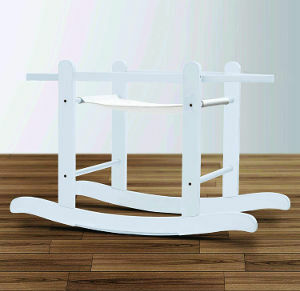 You can separately buy a compatible stand for this basket if you need the Moses basket to have a permanent home. 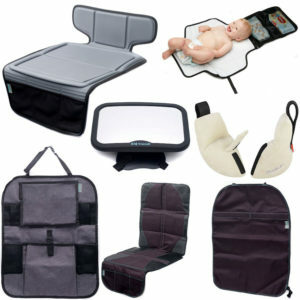 Suitable from new-born to 6 months or up to 9kg. The Kite Blue Moses Basket is another gorgeous piece from the Kinder Valley range. Like the Tiny Ted, the Kite Blue basket is made entirely of woven palm. If you prefer more traditional decor in your nursery, this little piece will seamlessly blend in. 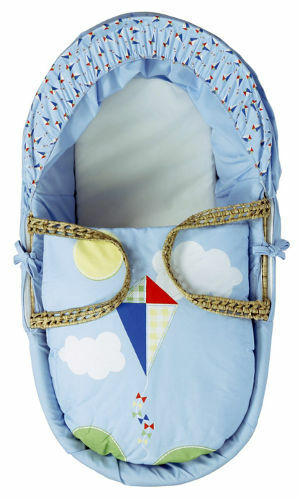 The Kite Moses Basket comes complete with a breathable mattress so your baby will remain comfortable all night. The mattress is water resistant as well so you’ll have total peace of mind at night. The basket is lined with easy-care polycotton and padding; you won’t need to spend more money on dressings or sheets. 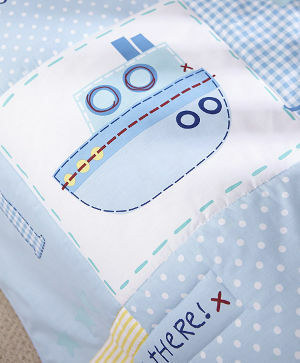 More importantly, the soft polycotton lining ensures the cosiest conditions for your baby whenever he’s in the basket. As the name suggests, the material has a lovely kite motif on both the coverlet and hood which is eye-catching and different from more traditional teddy designs. 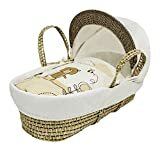 The basket features nicely woven carry handles that are short and strong so you can carry the Kite Moses Basket anywhere around the house and keep your baby close by during nap times. And of course there’s a nifty hood that comes in handy if they’re any draughts in the bedroon; your baby will always be kept warm inside his basket. The Kite is definitely the basket to buy if you’re looking for a good balance between comfort and price. 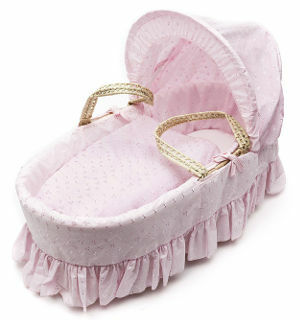 As you prepare to welcome your little princess into the world, it is important to get her the best girls Moses basket. Hopefully we’ve found few great pink designs that will keep your newborn in comfort for their first few months. Classy, compact and trendy, the Kinder Valley Daisy Boo Moses Basket is the perfect starter bed for your little princess. A soft all round padding ensconces the baby in a safe and luxurious sleeping space. The cute little adjustable hood shield the eyes from the harsh glare of light, letting them sleep peacefully even during the day. The firm mattress with soft cover ensures that your sleeping beauty is comfortable without compromising safety. The breathable nature of the mattress encourages air circulation to guard against heat build-up. Hence, your lovely princess can nap blissfully without feeling uncomfortable. Good air circulation ensures that baby sleeps in a clean and fresh space while reducing the risk of respiratory ailments. The easy-care polycotton material binding the soft padding lets you keep the Kinder Valley Daisy Boo Moses Basket clean with great ease. The comfortable baby-safe mattress is also water resistant to keep the baby’s sleeping environment clean and sanitary. In case you have an accidental leak, you can toss the mattress into the washing machine since it’s machine washable. 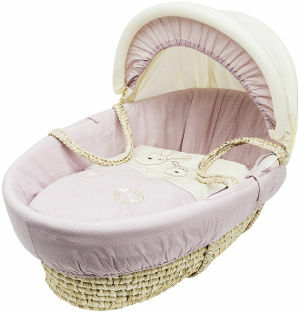 The sleek and compact design makes this Moses basket the perfect addition to your daughter’s nursery. Beautiful cartoon characters in a delightful shade of pink give the basket a beautiful and appealing look. The polka dots only serve to enhance the undeniable appeal. These beautiful Moses baskets measure 86 x 47 x 30 cm. The Kinder Valley Broderie Anglaise Moses Basket is a unique starter bed that oozes class and elegance. This starter bed features a comfortable baby-safe mattress to let your little angel sleep in sheer comfort. Soft and breathable, the mattress encourages air circulation to ensure your angel sleeps in fresh and cosy surroundings. 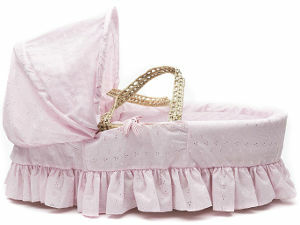 A beautiful, easy-care polycotton cover with lovely pink broderie anglaise fabric gives the Moses basket a timeless appeal. Two lightweight collapsible handles make it easy for you to move the baby with absolute ease. Better yet, they make it easy to have a firm one-handed grip on the basket when moving from one room to the next. The ultra-soft, all round padding absorb any vibrations to ensure your little princess can sleep uninterrupted. The padding also eliminates any hard surfaces that might bump your little girl. The beautiful yet functional hood makes the Kinder Valley Broderie Anglaise Moses Basket a handy companion when venturing outdoors. With a few twists of the screws, you can adjust its position and ensure your baby is comfortable. The design of the hood makes it easy to keep an eye on your sleeping angel while keeping any bright lights away from her eyes. 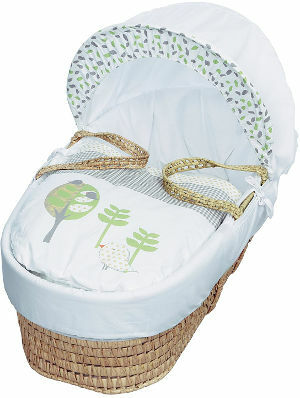 The Kinder Valley Three Little Birds Moses Basket is the most affordable of the three baskets we recommend for girls. However, this price tag doesn’t make the natural fibre any less perfect for keeping your princess safe and comfortable. All-around soft padding ensures that your baby suffers no bruises or bumps while sleeping. The baby safe mattress feels firm and comfortable on your baby girl’s back to foster proper development. 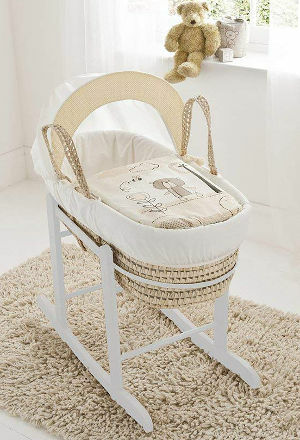 The delightful light coloured, easy-care fabric with beautiful characters gives the Moses basket a charming appeal. The lovely patterns on the basket are easy on the eyes and serve to complement any theme you might have going in your nursery room. The cover on the adjustable hood boasts two kinds of pattern to achieve a different effect with the hood up or down. The washable baby-safe mattress makes it simple to keep your baby’s surroundings clean and sanitary. In the case of a leak, simply put the waterproof mattress into your washing machine. The easy-care cotton cover on the basket is easy to remove and put back when you need to wash it. You only need to undo a few knots to tie them back once the cover is clean. With the breathable mattress, you don’t have to worry about getting too warm. 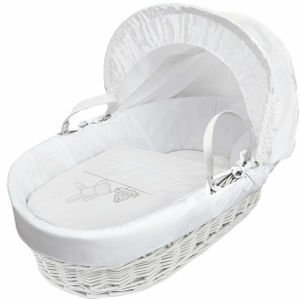 It allows a smooth flow of air in the Moses basket to keep your daughter safe and comfortable. 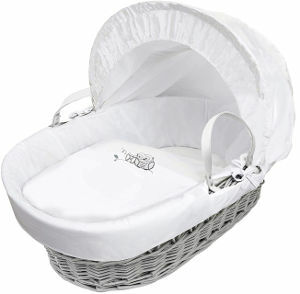 These Moses baskets measure 86 x 50 x 30 cm to fit the standard Moses basket mattress. 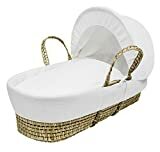 Moses baskets are just the ticket when you have a newborn in the house. They provide a safe and warm environment at this crucial stage of their lives and can easily be moved from room to room so your baby is always sleeping by your side. If you have a small bedroom, a Moses basket and a stand means you can have your baby in with you for the first six months before transferring them to their cot in their own bedroom. We’ve taken a look at some of the best available at different prices, designs and with or without stands so you can take your pick to find the one that works best for your family.